Sigma Construction has recently completed a House Extension in West Hampstead, London NW6, creating a beautiful and spacious open-plan kitchen for our client. Adding an extension to a property is a great way to create the home of your dreams without moving. Our clients’ vision was to open to brighten up the living area and give them a larger kitchen, somewhere to enjoy family meals or entertain. The existing kitchen was small and fairly dark, with no room for a kitchen table and very little space for cooking or entertaining. The existing living room was a separate, secluded area, which our clients therefore felt was ripe for renovation. Our team at Sigma Construction, together with the interior designer and architect, took the general NW6 area as their starting point. This was a crucial step, which allowed them to assess the type of design would best benefit the client. 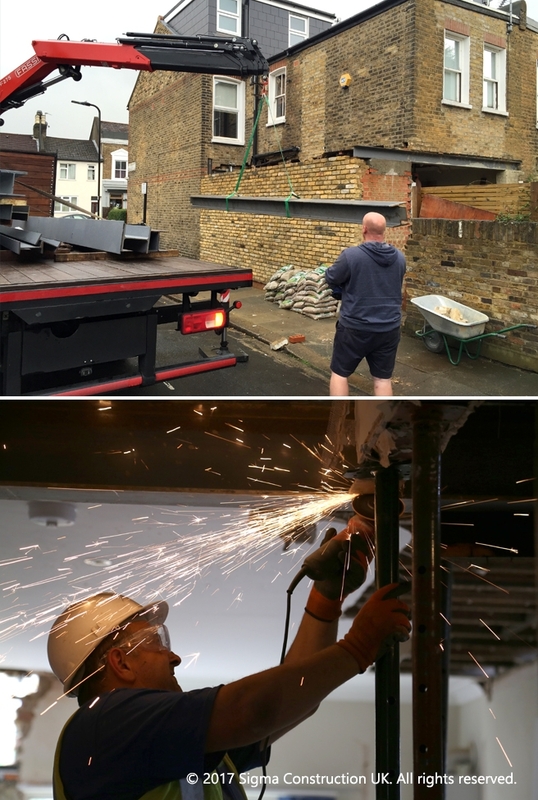 Our team next surveyed the NW6 property to ensure that any proposed designs met the building regulations, and also were in keeping with both the house interior and exterior. In this particular West Hampstead kitchen extension, the interior designer and architect both agreed that opening up space by knocking down the wall and separating the kitchen and living area would give our client the bright spacious living space they were after. At Sigma, we make our clients our priority; working alongside an interior designer and architect means that any proposed layouts give our clients the best possible design befitting their lifestyle and needs. Once the proposed layout was agreed and our clients happy, our team of builders began the construction work. 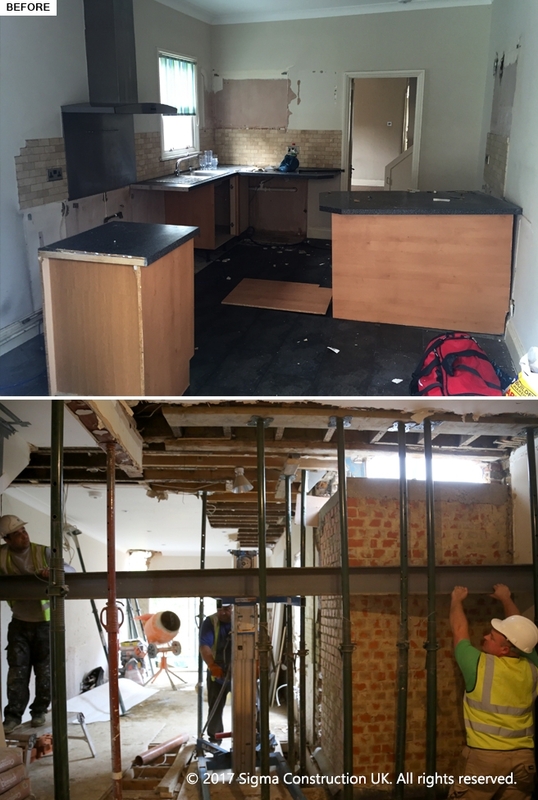 As part of this West Hampstead kitchen renovation the initial step was to gut the space and give our builders a clean working area; this followed upon knocking down any unnecessary walls, making the new open-plan downstairs area flow a lot better and feel much more spacious. 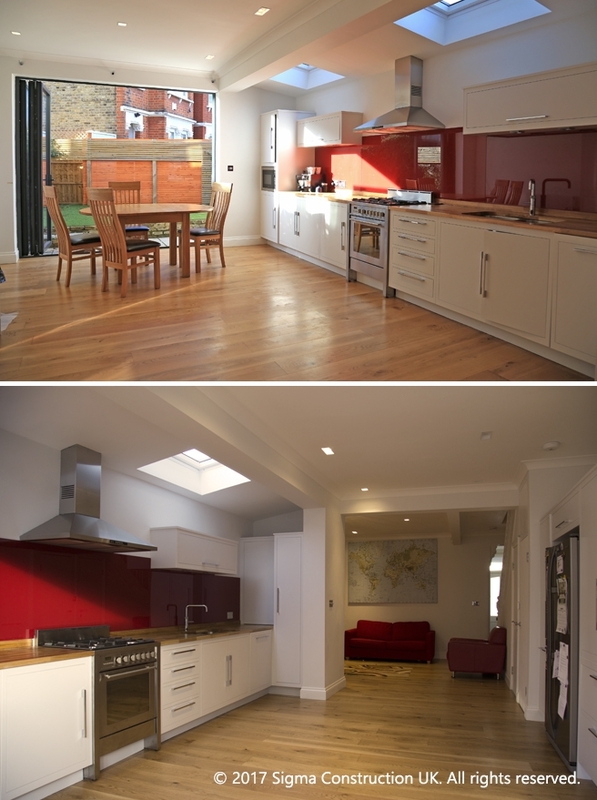 The new design enabled our client to have a clear opening from the living room to the kitchen. The open plan gave our client the benefit of a new, brighter kitchen, as well as a brighter living room, due to the large opening in the wall letting natural light in. Once the new walls were in place, the next step for our builders was laying the wooden floors, painting and general decorating. Our builders made sure all the new walls were fully prepared prior to any painting being started, so that the end finish was done to the highest possible standard (see photos). The final steps were installing the new kitchen with chrome appliances, which blended very well with the rest of the proposed colour scheme. Typically, extensions are added to the side or rear of the property, which allows maximisation of links with the garden, creating a beautiful large space. Our client wanted to maximise the supply of natural light, so as part of this single story house extension we proposed a set of bifold doors. Bifold doors are a great addition to any home, and are renowned for providing comfort and convenience whilst expanding your living space. In this West Hampstead house renovation the use of bifold doors gave our client a terrific view as well as access to the garden space. They could thus enjoy the outdoor space, and the comfort of being indoors, at the same time. The construction and build of any project is always one of our main priorities, but we also want to make our clients’ visions come true. To offer our clients a truly complete package we have built a team of professionals to make sure that once the remodelling is complete the design and aesthetic side of the project is also done to the highest standard. We knew that keeping the space light was key for our clients, so having discussed the scheme with them, and introduced them to a variety of samples and finishes, our team recommended the incorporation of light-coloured kitchen units, with a red splashback and an oak finish worktop, as that would function best. These colours blended very neatly with the rest of the ground floor interior. In order to make the open plan feel like one space, we proposed using the same oak flooring throughout the downstairs: our clients liked the idea of unifying the space rather than zoning it with different types of flooring. Keeping a consistent design works very well with open plan spaces, especially when the initial concept is to make the area appear as spacious as possible. At Sigma Construction, we enjoy making our clients’ visions and aspirations come to life, and our team have once again made that happen, and our clients were left with a comfortable and aesthetically pleasing interior in which to relax and enjoy life.